Eggs, cheese, sauce, and chips! 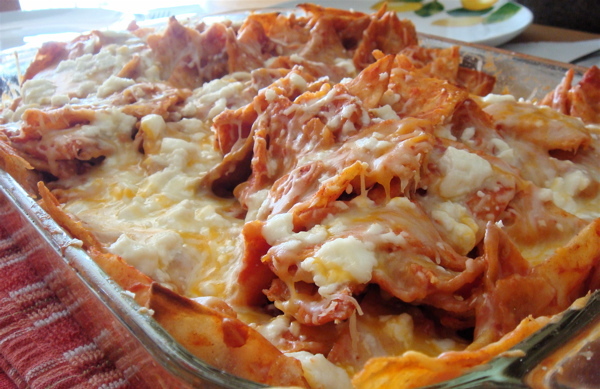 Chilaquiles (pronounced chee-la-key-less) are a delicious breakfast treat! Great Breakfast for dinner recipe! 1 cup additional enchilada sauce optional for topping. In a pot, add ½ cup enchilada sauce, 2 cups chicken broth and stir. Remove the chicken from the sauce and shred with a fork. Whisk eggs, 1 cup cheese, and milk. In a large pan, saute onion with oil and toss in the salt. Cook and stir for a few minutes. Add the egg mixture and thicken for a minute or so. In a large bag, add chips and remaining enchilada sauce. Shake until sauce has coated the chips. Immediately add chips to the egg mixture and stir until eggs have coated the chips (the eggs will be a a bit runny). Mix in the shredded chicken. Pour into greased casserole pan. Top with remaining cheese and additional sauce is optional. Bake for 10 minutes to finish cooking egg and melt the cheese. Drizzle with sour cream and more enchilada sauce, optional.